In modern dentistry we use special resin-based composite filling materials which contain extra particles of ceramics for more endurance. These materials are available in many colours and shades and have until today almost entirely taken over the role of the silver-coloured material, also known as amalgam. The great advantage of composite is that it stays plastic for a considerable time after placed into the cavity, and can be formed into the desired shape. After that, illuminated with a special blue lamp on a certain wave-length, it sets within seconds. Because it only sets to light, sufficient time is provided for the dentist to create a form that is identical to the original tooth. Since the colour and translucency of our teeth are different, we apply various colours and layers to mimic nature. The problem with amalgam fillings is not just a matter of esthetics, with time the filling shrinks and a slight gap next to the surface of the tooth might occur. In this small fosse plaque can accumulate and bacteria have chance to thrive, resulting in the secondary decay of the whole filling. 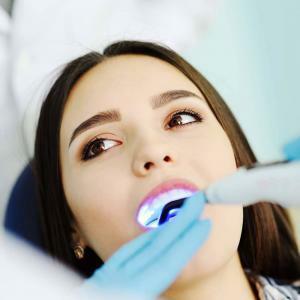 Due to the greyish colour and the opacity of the material, we tend to notice the progress too late and therefore when it comes to an actual toothache, it is often time for a root canal treatment. For this preventive reason, we advise all of our patients to let their amalgam fillings be replaced and checked for further decays.